The EAP field for about a 20 years has been bombarded with very powerful interests seeking to take what EAPs offer, carve out a piece here or there, and call it their own. Many have borrowed the name EAP and sold it as a service for a secondary purpose like helping contain behavioral health dollars. Few if any other functions are offered in many cases, but the product is still defined as an EAP. Although EAPs focus on helping troubled employees and our key activity is the assessment and referral process, the gift within the discovery in the core technology is the ability to manage and intervene with many types of human behaviors and risks the emanate from them. The association, which is us, can shepherd EAPs back to their original value proposition by making it NOT okay to calling anything that sort of smells like an EAP, an EAP. 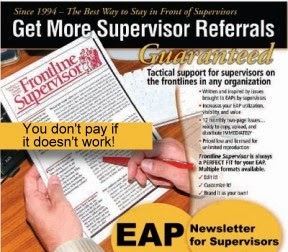 Although internal EAPs frequently possess the political clout to get behavioral risk projects initiated in an organization – external EAPs still hold the future of the profession in their hands because most American businesses are small and require vendor services. 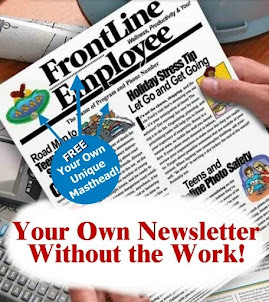 HR Journals like HR and WorkForce Magazine have not been helpful to EAPs. Even when they mention EAPs and you and I are pleased to see the acknowledgement of what EAPs do, look closer, because almost 100% of the time EAPs are misrepresented as employee benefits, counseling, and clinical services within the 800# context. These messages have been consumed by the HR community and benefits consulting industry, and these folks are the primary purchasers and influential persons responsible for making EAP purchasing decisions. A proper definition must begin to be delivered and it would be helpful if the association or a recognized group of "core technologists" would be charged to "codify" the Core Technology so a recognized program represents the spirit and intent of what EAPs were always supposed to be based upon the complete continuum of capability they offer to business and industry. 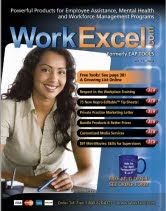 Do you have a copy of the WorkExcel.com Catalog? You can get one here.